Marking the entrance to Scituate Harbor at Cedar Point. Grounds around the tower are open to the public year round. Scituate’s first Keeper was Simeon Bates in 1811. He and his wife had nine children living at the lighthouse where two of his daughters became heroic figures in the area. During the War of 1812, in 1814, Abigail and Rebecca Bates were called the "army of two" for "preventing a British Naval Force from sacking the town by playing a fife and drum," deceiving the commander of the British warship into thinking the Americans were massing an army. They received, in their later years, pensions from Congress in recognition of their heroism. Years later, some locals claimed to have seen the ghosts of the daughters and heard strange music playing by the lighthouse. In 1813, a famous sea battle occurred which could be seen from the lighthouse between the American USS Chesapeake and the British HMS Shannon. The sea battle itself is not so famous, but the final words of the Chesapeake's Commander, Captain James Lawton, is well known when he cried "Don't give up the ship!" During a blizzard that occurred on March 16, 1956, the Italian freighter Etrusco ran aground near the lighthouse and could not be removed until the following December. It became quite a tourist attraction. Due to its close proximity to sea level, the lighthouse has been prone to many storms where it becomes isolated by the over wash from huge storm surges created, which would sometimes breach the seawall. The structure and surrounding buildings were damaged by rocks, boulders, and debris thrown around the areaduring various fierce storms. Recently the Blizzard of Dec 26, 2010 caused the most damage to the lighthouse, tunnels, and cottage, and flooded many neighboring homes. During the February 7 Blizzard in 2013, the Keeper, Bob Gallaghar (previously a teacher), who also tended the light in the 2010 blizzard, was urged by the Police Chief of Scituate to leave the lighthouse and head inland for safety (which he obliged), as the surge breached the seawall again and caused more damage to the lighthouse, buildings, and many homes nearby. 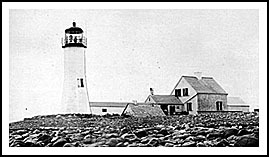 Scituate Lighthouse is still the oldest complete lighthouse, in regards to the lighthouse itself and the lightkeeper's cottage (keeper's quarters) in the country. Grounds around the tower are open to the public year round. There is a nice walk along the breakwater jetty for views of Scituate Lighthouse from the water. 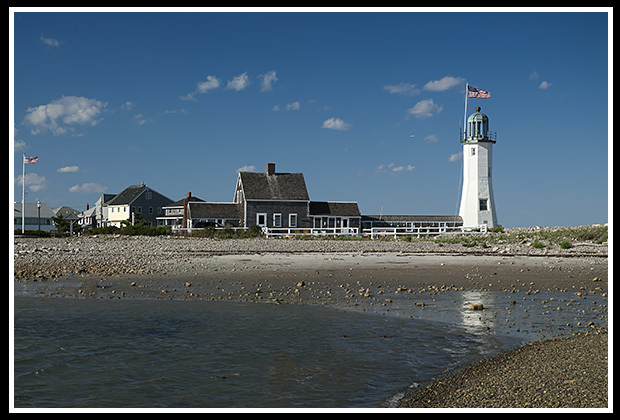 There is ample parking to enjoy the day at the beach by the lighthouse, or visitors can drive along several miles of shoreline and enjoy some of Scituate’s other beaches and oceanfront recreational activities. 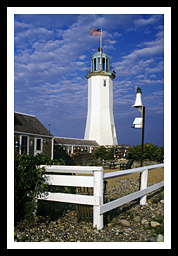 The area around the lighthouse is a favorite for many artists to paint and enjoy, and many locals are members of the Scituate Art Association. Scituate is mid-sized seacoast town with specialty shops and restaurants visitors can enjoy. Each year the town puts on Scituate Heritage Days in early August to celebrate the town’s history, with lots of events and entertainment. Scituate also boasts as having one of the best golf courses in America called the Widows Walk Golf Course. At the Braintree split (Exit 7, Route 3 South) stay to the left side lane. Follow Route 3 South to exit 13, and then take Route 53 North to Route 123 (Main Street). Cross over Route 3A and Route 123 becomes Country Way. Follow Country Way then take a right at First Parish Roa. You'll pass the stone Lawson Tower. Then turn left onto Front Street to Jericho Road. Turn right onto Jericho Road, follow to Lighthouse Road, and then turn right. Continue on Beaver Dam Road for about a mile and a half to Jericho Road. Turn left on Jericho Road and follow it around the harbor to Lighthouse Road. The lighthouse is located at the end of Lighthouse Road. Both Boston Harbor Cruises, and Friends of Boston Harbor Islands cruises offer many types of cruises. They pass by Scituate Lighthouse during some their lighthouse cruises. 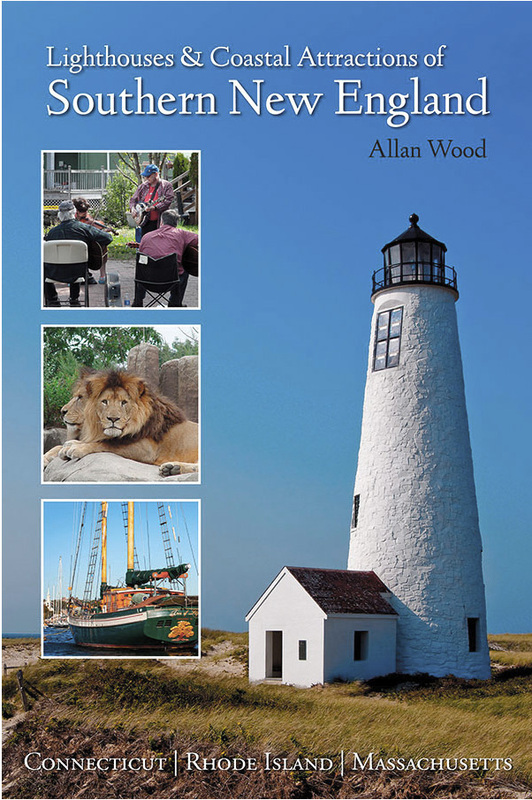 My book, Lighthouses and Coastal Attractions of Southern New England: Connecticut, Rhode Island, and Massachusetts, published by Schiffer Publishing, provides special human interest stories from each of the 92 lighthouses, along with plenty of indoor and outdoor coastal attractions and tours you can explore. In the book you'll find local stories from all lighthouses in the Boston area and South Shore region, including more details about the "Army of Two."